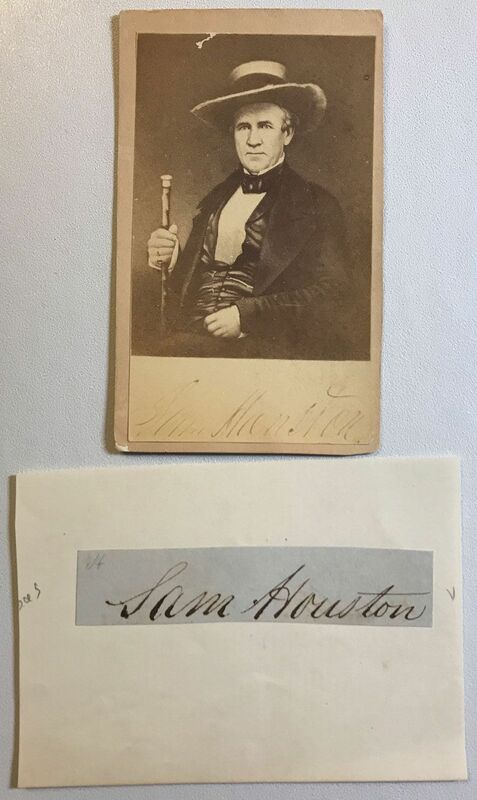 Outstanding Sam Houston cdv and clipped autograph. Large clipped signature (3" x 5/8") and cdv of Houston wearing his hat and holding his cane. This combination would look great framed! Minor scuff near top of the cdv, otherwise both items are in very good condition. The signature at the bottom of the front of the cdv is part of the photograph. No photographer's b/m. On March 2, 1793, in Rockbridge County, Virginia, Sam Houston was born to Major Sam Houston and his wife Elizabeth Paxton Houston. He was the fifth of nine children. The family moved to Maryville, Tennessee in 1807 shortly after Major Sam Houston’s death. Sam Houston enlisted in the U.S. Army and, in 1814, he was badly wounded at the battle of Horseshoe Bend, Alabama. He remained in the army until 1819, when he resigned his commission as a First Lieutenant and returned to Nashville, Tennessee, to read law. He opened a law office in Lebanon, Tennessee, six months later. In 1819 Sam Houston won his first public office, Attorney General of the Nashville District, and in 1823 he was elected to the U.S. Congress. In 1827 he won the Governorship of Tennessee and remained in office until his separation from his first wife, Eliza Allen Houston, in April 1829. In April of 1833, Sam Houston settled in Nacogdoches, Texas, after four years in exile among the Cherokee Indians. There he opened a law office and became involved in Texas politics. In November of 1835, Houston was named the Major General of the Texas Army, and on April 21, 1836, he led the Texans to victory at the battle of San Jacinto. The Mexican army was defeated, and the Mexican President Santa Anna was captured and forced to grant Texas independence. During the next ten years, Texas was an independent nation, and Sam Houston served as its president for four years. After receiving a divorce from Eliza Allen, Sam married a young Alabama woman, Margaret Moffat Lea. He met Margaret in 1839, when he was 46 and she was just 20, and they were married on May 9, 1840. In 1844, the Houston family moved to Raven Hill plantation, approximately 15 miles east of Huntsville. In 1846, Texas joined the United States, and Sam Houston was named to serve in the U.S. Senate. In 1847, at the urging of his wife, Houston bought 170 acres of land located one and a half miles from downtown Huntsville. A year later he built a home and moved his family to Huntsville. Houston sold the Woodlands Home in Huntsville in 1858, when he moved his family to Independence, Texas, while serving his last term in the Senate. In August of 1859, Houston won a 10,000-vote victory in the election for Governor of Texas, but he served only a short time, from December 21, 1859, until he was deposed on March 16, 1861, for refusing to take the oath of allegiance to the Confederacy. In 1861, Sam Houston returned to Huntsville, where he rented the Steamboat House. There he died of pneumonia on July 26, 1863, and he was buried in Oakwood Cemetery. Houston’s wife Margaret died in Independence, Texas, in 1867.